A lot of clients initially train with me to learn how to deal with assaults involving weapons. This type of assault invokes a lot of fear in citizens and rightfully so. Attacks with any type of weapon are serious and deadly. In close quarters knives are the deadliest though. They have the greatest effect on a victim mentally and create a gruesome aftermath. Many martial arts claim to have an answer for how to deal with a knife but in reality they don’t. 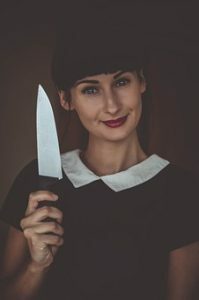 The reason that many martial artists can’t effectively train clients for knife-defense is because they don’t understand the forensic reality of how violent knife attacks happen. John Perkins expertise comes from experience in these types of situations and after studying thousands of crime scenes. Based on this he’s been able to accurately see what happened and attempt to solve the problems with these attacks. In this post we’re going to discuss how these attacks happen which is different than how martial artists train for them and how to go about fixing these issues. Attacks with a knife are fast, vicious and brutal. Despite this obvious reality, self-defense experts train people as if attacks are slow, one-directional and clumsy. That is NOT how attacks happen on the street. Attacks happen very quickly and the person hits multiple targets very quickly. Many victims of knife attacks report that it happened so quickly they didn’t have time to consciously realize what was happening. Additionally in many cases victims felt like they were being punched as opposed to being stabbed which can make the attack more dangerous. Often knife attacks come from an unexpected angle without the victim aware of where the attack is coming from. This is completely different than how many teachers train their students. They teach that an attacker presents the blade and then moves around the victim before lunging in. They give no consideration to the criminal being a murderer who is committed to killing their victim and doesn’t care about being hurt themselves. Additionally clients are trained to attempt to grab a knife-wielding attackers arm and disarm their attacker. This is virtually impossible to accomplish against a determined attacker. If you disagree try this simple test with a friend and email me the results. Have a friend attempt to stab you gently with a magic marker while you wear a white shirt and try to grab the marker. Put 20 dollars on the line and see how quickly your friend marks you up. Keep in mind this was a simulation where your partner didn’t really want to hurt you. That’s it for now folks! In the future I’ll write on this topic more and how YOU can defend yourself against this type of attack! Until next time…bring the chaos!